TLD readers who are mourning the loss of Californication (not me) and/or are anxiously awaiting the return of The X-Files (totally me) have a lil' but o' the Duchovny to tide them over until the reboot-- Holy Cow: A Modern-Day Dairy Tale. In his debut effort, Duchovny tells the story of Elsie Bovary, a cow on a small family farm whose idyllic days of milking and munching grass are upended when she learns what happens to all cow mothers eventually-- a date with the butcher. With the help of a Jewish pig named Shalom (nee Jerry) and a rail thin turkey named Tom, Elsie escapes the farm in an effort to avoid becoming a burger. Naturally, Elsie sets her sights on India, a place where cows are worships and not wantonly consumed. With Tom and Shalom in toe, Elsie breaks for the subcontinent. Along the way, the trio learn that turkeys can in fact fly [planes] and manage to bring about peace in the Middle East. Through their trans-global adventure Elsie and her friends learn that the grass isn't always greener on the other side. 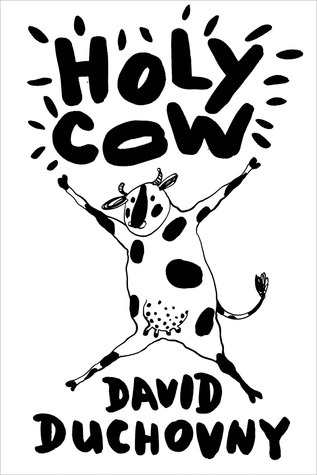 Holy Cow, as you might imagine, is a funny book; it is an entertaining, light read that livens up a dreary bus ride home. Duchovny makes pop cultural references and ubiquitous acronymic exclamations that, coming from the book's bovine protagonist, are funny but grate on the nerves. Had I picked up a copy of this book two years from now instead of the month it was released, I doubt that I would have found it as enjoyable as I did. Rather, Holy Cow is another celebrity vanity project, albeit one of a slightly better quality. Bottom line: read it if you miss Moulder and enjoy broad humor . . . but check it out from the library!